Expand your outdoor living space - install a modern pergola with an automatically controlled roof and side glasses. 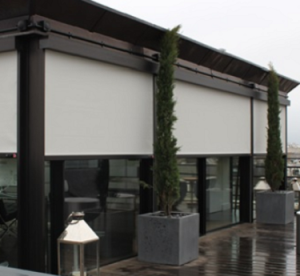 Are you looking for a modern and stylish terrace covering solution for your home or business? Automated, or motorized pergolas are low maintenance, durable and are a surefire way to enhance your outdoor space experience in any weather conditions. Our pergolas are made-to-order to individual specifications and can therefore vary in size from 5m² to 260m² to suit any homeowner’s or business needs. You can also choose from several types of structures, roofing, canvas designs, side panels, lighting and various automation solutions. Automated pergola is a functional and easily adaptable architectural structure made of aluminum beams that does not require additional construction permits. Such pergolas are a perfect cover for the patio or terrace of your home. They expand and improve your outdoor living space, provide protection from wind, rain and sunlight, and allow you to enjoy fresh air independent of weather conditions. 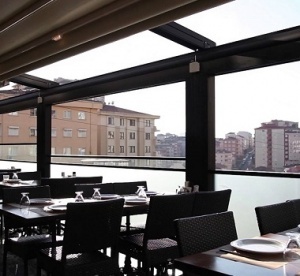 Pergolas are also ideally suited for hotels, restaurants and other commercial spaces. They provide an all year round shade and protection which will surely set you apart from competitors and help attract more customers. There are several ways to customize your automatic pergola: different construction designs, roof shape and construction types, side panel options, LED lighting variations and modes of control. Ultimately, the most suitable pergola model should be chosen based on the architecture, layout and individual needs of your home and outdoor area. The variety of colors, design options and supplementary components makes the pergola easily adaptable to the specific dimensions and requirements of your patio or terrace. Motorised retractable and bioclimatic type of pergolas are custom made to individual orders to ensure a functional yet highly esthetic addition to your home or commercial outdoor space. Pergolas can be installed as freestanding structures or mounted to the wall of a house. 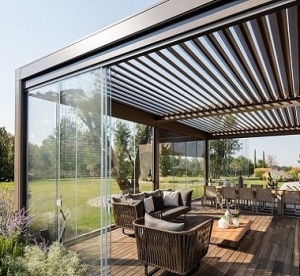 The installation of automatic pergolas also depends on the type of pergola roof cover, which can be made of retractable canvas or adjustable louvers (slats like in window blinds) as well as the shape of the roof, which can be curved, slanted or horizontal. 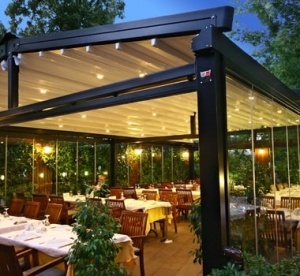 Depending on the pergola design its roof can be opened, closed or ajar, providing protection from any weather conditions. The price of a pergola depends on the size of the selected structure, model type and selection of additional side covers. We will provide you with a pergola price estimate after assessing your individual requirements. The time it takes to mount and install a motorized pergola will also vary depending on your needs and preferences. Precipitation: insulated overhead roof and waterproof fabric that draws rain water toward a beam in the front provides an excellent protection against precipitation. In addition, the extremely durable impregnated roof fabric is able to withstand heavy precipitation as well as winter snowfall. Wind: sturdy and airtight construction prevents wind from entering through the roof, ducts or rails of the patio, making sure that if you close the roof you will not feel any wind. Direct sunlight: the special properties of pergola roof fabric keep the heat and harmful UV rays out of your terrace, ensuring ideal temperature and relaxation on the terrace. By opting for an automated pergola you are getting a versatile protection from unfavorable weather and considerably extending the summer season in your backyard. Who doesn’t enjoy a little extra comfort? 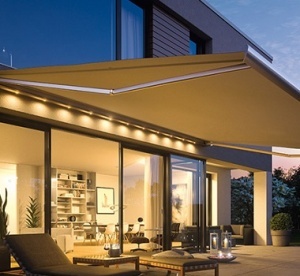 We offer several types additional covering for the sides of the pergolas such as vertical awnings, outdoor and sheer roller blinds or mosquito nets. If you are considering a glass-walled terrace you can opt for vertical, sliding or frameless glass systems or fixed glass panels for your patio. And for those seeking maximum comfort we offer tailor-made LED lighting and automation systems with smart solar, wind or temperature sensors. These systems allow you to program automatic control of the windows, roof and walls of the pergola depending on weather conditions. 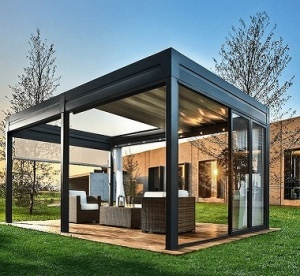 Furthermore, the pergola roof, windows and lighting can be controlled remotely by an app on your smartphone or computer. We also recommend installing additional infrared heaters so you can use your terrace comfortably throughout the colder months of the year.